Representatives of the KDDL Committee, president Craig Taylor, secretary Jim Scollie, and committee members Iain Wilkie and Stevie Linklater), attended an informal cheque presentation in early May, where we presented our charity cheques for the year, as well as the charity money which was raised last season. Dementia Friendly Orkney received £1600, Orkney Heart Support Group £500, with the RNLI and Fishermen's Mission presented with £575 each. A total of £3,250. 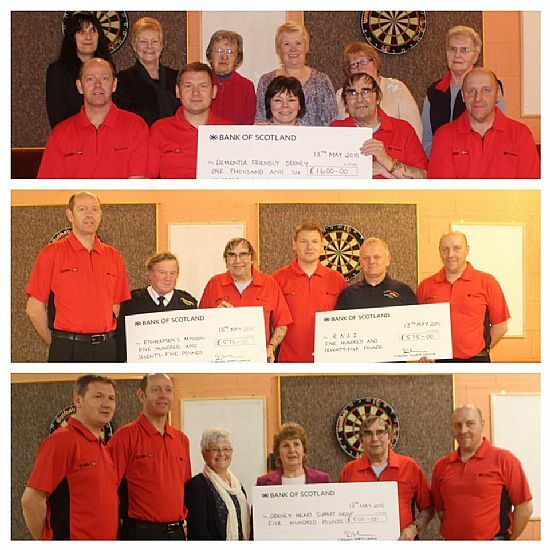 At the presentation Craig explained that the money is raised by all the players and committee, who come along, take part, and support the events throughout the darts season.